One of the games that Steve designed for WorldWinner, Catch 21, has been turned into a TV game show on the Game Show Network (GSN). The show began airing on Monday, July 21, 2008, and can be seen on GSN at 7:30pm EST each week night. Catch 21 first went live on WorldWinner.com in 2001, and has been one of the most popular games on the site for years. Client-side programming for the game was done by Shawn Campbell, and server-side programming was by Keith Costorf. The original artwork for the game was created by Alex Weisman. Credit also goes to John Eskew for suggesting the name "Catch 21" (after the game's original name, "Blackjack Attack" made the game sound too luck-based, even though it's a skill-based variant of "Blackjack"). 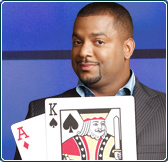 The Catch 21 game show is hosted by Alfonso Ribeiro, who is most well-known for playing Will Smith's cousin, Carlton Banks, on The Fresh Prince of Bel-Air. You can read more about the show and its host on the GSN website, and you can play Catch 21 on WorldWinner. Last updated: 7-24-08. Contact boffo@boffo.us.